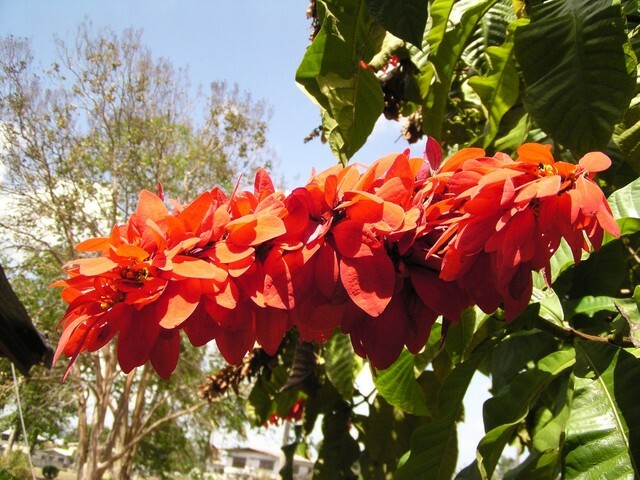 Warszewiczia coccinea (or Chaconia, Wild Poinsettia and Pride of Trinidad and Tobago) is a species of flowering plant in the Rubiaceae family. It is the national flower of Trinidad and Tobago because it blooms on 31 August, which coincides with the day that Trinidad and Tobago became independent from Great Britain. It was named Chaconia after Trinidad's last colonial Spanish Governor Don Jose Maria Chacon, who is credited with a vast upgrading of the island and its capital Port of Spain.